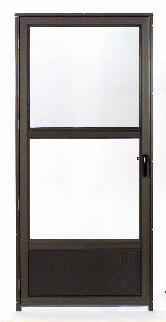 The Columbia Tiara aluminum storm door has a 1-1/4″ master frame. This aluminum storm door is a full view, double-track self storing door with removable glass and screen insert. Screen insert is in upper insert position versus lower position. Available in almond, black, bronze, sandstone or white baked-on enamel finish.